Our lead product, the INVAC-1 DNA vaccine contains a plasmid encoding an inactive yet immunogenic form of human telomerase, which is optimized to facilitate degradation and enhance peptide presentation and telomerase-specific immune responses. The Phase I trial has demonstrated very promising clinical results in patients with various grade IV cancer indications. Invectys is conducting a Phase II clinical trial in Chronic Lymphocytic Leukemia (CLL) at the MD Anderson Cancer Center in Houston. 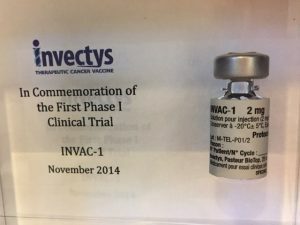 UCPVax stands for Universal Cancer Peptides vaccine. A selected pool of highly immunogenic peptides from hTERT that strongly bind to HLA class-II, it can be used in theranostic strategies: as a prophylactic vaccine, to assess the immune status of the patients as a criteria for inclusion, for immuno-monitoring during clinical trials, or to provide universal help for any type of immunotherapy. 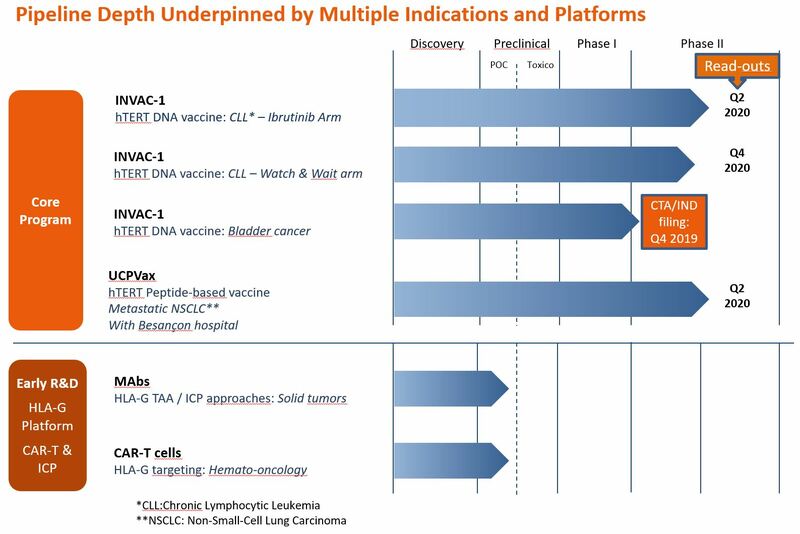 UCPVax is currently in Phase I/II trial in Non-Small Cell Lung Cancer (NSCLC), in partnership with the Besançon hospital. Invectys’ HLA-G technology branches out into two main applications: a line of Immune CheckPoint inhibitors and CAR-T Cells. HLA-G is an immune checkpoint, naturally present at the fetal-maternal interface, which blocks the strongest immune response currently known: the allogeneic response. Because of its broad action over the immune system, it is used by at least 50% of tumor cells to evade the immune response. 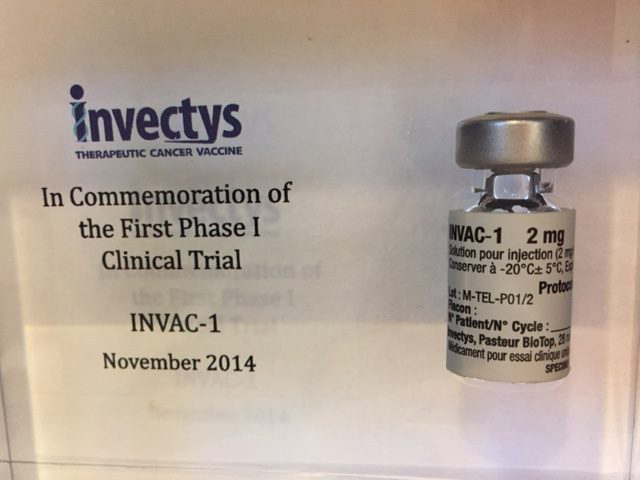 Invectys was able to produce a new generation of monoclonal antibodies specific to HLA-G and inhibitory monoclonal antibodies are currently isolated to target and disable this checkpoint to restore immune functions. Invectys has generated several chimeric antigen receptors directed against HLA-G. In vitro, these HLA-G CAR-Ts targeted all immunosuppressive HLA-G isoforms, either associated or not with the β2-microglobulin, and lyzed HLA-G expressing tumor cells. Clinical trials are expected to start in 2020.